The polder grasslands of east coast Belgium are important wintering grounds for pink-footed geese and many other grassland and waterbirds. Since the 1960’s there has been a significant loss of traditional polder grasslands as a result of drainage and shifts to other more intensive forms of agriculture. This LIFE funded project, managed by Natuurpunt aims to restore a number of key polder grassland sites tackling the threats to the unique habitats and species, which are characteristic, of these important grasslands. Some 2000 years ago original mudflats (coastal wetlands formed when mud is deposited by tides or rivers) along the Belgian coast were closed off by a dune belt, behind which an extensive area of peat bogs formed. Incursions by the sea during the Middle Ages caused this bog to become saline and left it covered with a fertile layer of mud. This land was converted to polders and has been used mostly for grassland pasture subsequently. Since the 1960s, polder grasslands along the Belgian coast have been levelled, large areas drained, excessively covered in manure or transformed into maize fields or high-yield grasslands. Nevertheless, polder areas remain along the east coast of Belgium but these centuries old fertile grasslands are seriously threatened. The threats are not only from landfill, levelling and conversion to intensive agriculture but also from unfavourable water management and not maintaining existing beneficial relief structures (windmills and dams etc.). The polders are important breeding and wintering areas for many grassland birds as well as waterbirds. The Pied Avocet (Recurvirostra avosetta) is the most important breeding species. Key wintering species are the Pink-footed Goose (Anser brachyrhynchus), Greater White-fronted Goose (Anser albifrons) and Eurasian Wigeon (Anas penelope), as well as the Short-eared Owl (Asio flammeus). 60 to 80% of the Svalbard population of pink-footed goose overwinters on the east coast Belgian polders. Moreover, the polders are used for hunting by Western marsh-harrier (Circus aeruginosus) but suitable nesting sites seem to be lacking. These primary target-species act as umbrella species for others like Barnacle Goose (Branta leucopsis), Black-winged Stilt (Himantopus himantopus), Eurasian Curlew (Numenius arquata), Northern Shoveler (Anas clypeata), Black-tailed Godwit (Limosa limosa) and Garganey (Anas querquedula). The central objective of this LIFE and Natuurpunt project is the large scale restoration of typical grassland habitats in the polders of the Belgian east coast region. These are the Belgian core-areas for inland saline habitats which are important breeding and wintering territories for many bird species. The 2 key vegetation habitats (1310 Salicornia and other annuals colonizing mud and sand and 1330 Atlantic salt meadows Glauco-Puccinellietalia maritima) form a patchy network throughout the project area. Due to their size and isolation, patches are very vulnerable to further degradation. Another project objective is to upgrade both the quality and quantity of these saline habitats. Polder grassland restoration will protect and connect target habitats, establish the favourable conservation status of habitats and develop sufficiently large populations of target species to allow for their sustainable long-term survival. Restoration of 210 ha grassland, of which 70 ha with saline habitats, by restoring the typical micro relief of these pastures and meadows. Creation of an extra 5.5 ha of core saline habitat by removing the upper soil layer. Improved grazing regimes by placing 47 km of fences. Hydrological optimization by placing three windmill-driven water pumps and nine weirs. Creation of three new suitable nesting sites for Western Marsh-harrier. Written detailed plans for efficient and effective habitat restoration. Monitoring data for saline habitats, grassland and water birds in the target areas. Improved local support and involvement by informing of and communicating with the local community, press and politicians. 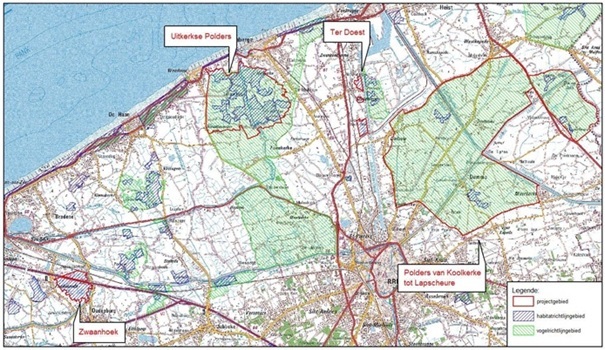 The LIFE Oostkustpolders project is situated in a circular area of about 20 km around Brugge in West-Vlaanderen, Belgium. The project sites are within four key polder areas: Uitkerkse polders (1223 ha), Zwaanhoek (166 ha), Ter Doest (63 ha) and Polders van Koolkerke tot Lapscheure (5247ha).